Dorma is the epitome of classic bedlinen, with timeless elegance and opulent detail. Legendary quality, craftmanship and inspired design have made Dorma a much-loved household name for decades. For period interiors their classic designs evoke vintage eras; for contemporary living their modern looks are the last word in chic. Excellent design is Dorma's style and their substance. Aside from their love affair with luxury, Dorma select materials for comfort, ease and longevity. When choosing between better and best, Dorma always pick best, exceptionally high thread counts, quality weaves, fine lace, satin, damask-luxury with attention to detail. Dorma are incredibly proud of their reputation for producing beautiful bedlinen of top drawer quality since 1921. So it is no surprise that they still set their standards above the industry benchmark for quality and design. 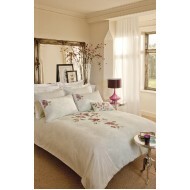 Dorma don't produce any bedding below 200 thread count, which far exceeds most mass market bedlinen. You will find impeccable attention to detail and insistence on peerless quality in everything Dorma create from their world-renowned Dorma bedding. You can feel the difference every time you turn down your bed, open your curtains or snuggle down to relax after a busy day. Exceptional design with quality at its core has always been the hallmark of Dorma, and why, once you have become acquainted with the Dorma brand, you will refuse to accept pale imitations. As well as looking good, their linen is designed and tested for light and colour fastness, and resistance to shrinking and pilling. So you can enjoy the same level of luxury for years to come. Dorma Cameo Bouquet Elegantly classical, fine floral cameo motifs in a cotton-rich woven ja..
Dorma Lydia bed linen Softly trailing and finely embroidered roses overlay a shadow leaf bac..
Dorma Seymour bed linen This Dorma Royal Blue Seymour Bedlinen is inspired by the grand salons of..